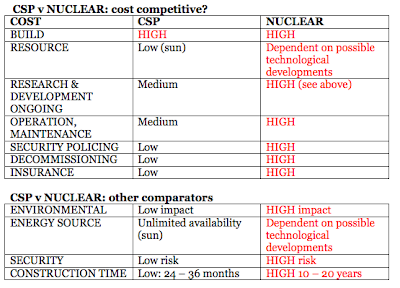 Why is it that you support 4th generation nuclear when Concentrating Solar Power can provide such an enormous slice of the baseload generation required, without any of the political, environmental and social detriment of nuclear? 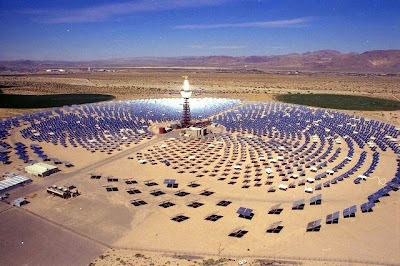 CSP is mature technology, overnight storage is not a problem, it will be fully commercialised by 2011 - 2012, when (going by current known contracts) 9GW will be online globally, and it is anticipated if expansion continues at a conservative rate of 29% per annum, then 200GW will be online by 2020 (compare with 100GW online for wind as of this year, after 25 years). It's environmentally benign - even positive when you combine it with desalination, fast build (2 - 3 years from granting of licence to grid connection), no high insurance costs, no decommissioning and waste headaches, no trans-border devastation when bombed by an irate terrorist - only 7 years bad luck (and why bother to bomb a bunch of mirrors where each fresnel mirror can now be built and replaced in 3 minutes in any event) ...and even the political will is cranking into action now with the Med Solar Plan (20GW in North Africa by 2020) under the recently endorsed Union for the Mediterranean, the removal of the Feed-in Tariff cap in Spain due later this year (20GW by 2020), another 16GW is expected in other southern sunbelt EU countries, the generous state credits in South West America esp in California (30-50GW by 2020 thanks mainly to Arnie's ambitious targets), the Masdar Project (500MW by 2013), India (generous FIT's for solar put in place earlier this year), China (test plant outside Beijing) etc etc. CSP does not pose an energy security risk; it is not a finite resource that is being threatened (and therefore one that we go to war over). It is dependent on the heat from the sun in the deserts - an abundant resource and, moreover, less than 1% of the world's deserts can give us all our global electricity requirements - so no worries on that front either. We can therefore switch all land-based transport over to clean electricity as well. As for transporting the stuff - easy: High Voltage Direct Current lines (which have been in use since the 1950's), such as the HVDC links that run from the 3 Gorges Dam in China to Guangdong - 2,000 kilometers away - with just 3% losses per 1000 km. So, why do we not hear more from you guys - the heroes of the environmental world - supporting, lobbying, promoting, fighting, shouting for CSP, rather than announcing your qualified support of nuclear? Shame on you. If you would like to know more about CSP, check out TREC-UK and for an easy intro: concentratingsolarpower.info. Why don't you hear more from us? O.K. (laugh) Here I am sounding off! Seriously though, thanks for keeping up the good fight. It's people like you and I that have to put out the knowledge for those not as motivated to do the hard work of research. Alter the Eco and keep up the good fight!